I am planning to hold an online seminar soon and would like to check with you if you would likely attend and the topics you would like me to cover. I would appreciate your help by completing this very short survey taking less than a minute of your time. Many thanks. Yes, folks. It’s that time of the year I call the Davos Depression. It’s where major figures in the finance and government world (they heavily overlap, of course) prognosticate about the economic weather ahead, much in the manner of Punxsutawney Phil, the most famous groundhog this side of the Rio Grande. And true to form, they are coming all over doom-and-gloom as six more weeks of economic winter looks likely. But is it? See what I mean? So naturally, stocks remain elevated. It may not be a Golden Rule, but to fade alarmist comments from CEOs of financial firms and such ‘leaders’ is not a bad trading strategy – at least in the short term. That reminds me of the famous Peter Principle that states: “In a bureaucracy, people get promoted to the level of their incompetence“. They rise up in the organisation based on previous success, but struggle when landed a top job. Have you worked in a large organisation? If so, I am sure you have noted how hopeless some at the top are and wondered how they got there? Well, now you know. You see it all the time – in politics especially. But I am constantly amazed at how much weight the MSM and public attach to the utterances of ‘top’ people especially in the area of forecasting economies and markets. These ‘top’ people usually have little hands-on day-to-day experience any more with the ever-changing markets and anyway, large firms all talk to each other and develop a Groupthink consensus. It’s the reliable career-preserving stance. Jeremy Grantham is a prominent hedge fund manager who also believes the earth needs saving and is betting heavily on ‘green’ companies. Saving the Planet has become a new religion in that a lot of faith is required to ‘prove’ that a two degree rise in temperature will occur and if it does, it will be the sole fault of the carbon dioxide that is generated from fossil fuels. I just have one question: the concentration of carbon dioxide in the atmosphere is 400 pp million. That is four carbon dioxide molecules for every 10,000 oxygen and nitrogen molecules. That is about the same as finding a needle in a haystack. So will the massive changes in the earth’s climate that is universally feared by the alarmists result from a few more carbon dioxide molecules per million? Anyway, carbon dioxide is an essential plant food. Without it we would not be here. I recall learning about the carbon cycle at school and I am quite sure it has not been abolished since then, as many would wish. I wonder if they still teach it at schools? I fear not. I am not going any more into the science (or lack of it, actually) of this highly contentious issue. The fact remains that ‘green’ policies will demand a considerable disruption in our energy supplies – and result in a savage hike in taxes. Already, the Jilets Janunes in France and several other countries have twigged – and they do not like what they see. And not to be out-done, the prominent Democrat Elizabeth Warren is proposing a 2% ‘wealth’ tax on the richest Americans. Any advance on 70 and 2? Yes, socialism is on the rise again in the good ol’ USA. With younger US voters gagging for more wealth distribution from a highly lop-sided chart, the Democrats are pushing on an open door. They have the bit between their teeth and it would take a miracle for Trump to overcome that headwind, especially if the stock market finally enters its third wave down with gusto. Of course, this is all in tune with the global trend of rising ‘populism’ (aka democracy). The have-nots are finally rising up against the governing-class elites who are increasingly seen as having engineered the greatest tilt in the playing field at least since the war. On a general note – politics here and in the USA are highly fragmented and emotions run at a feverish pitch. This is not a sign of a contented people and is a trait I associate with a bear market. Bull markets run on overall optimism and vice versa. 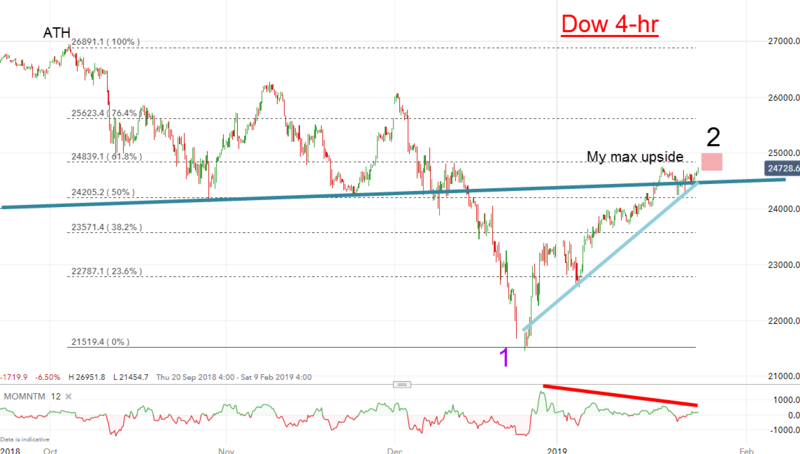 We have seen the first signs of the emerging bear market with the plunge down off the 3 October highs in the Dow/S&P/Nasdaq. But since Christmas, they have been in strong relief rallies that seem near their termination. There is little doubt they are climbing the latest Wall of Worry with all the negative news and comments (see above) about. Are stocks finally near a major top? The dark blue trendline reverts back a year ago and I consider it a good line of support/resistance. The market has been swinging around this line for the past several days. And yesterday afternoon, it made a precise hit on that level at 24,840. As an experienced trader, the stock indexes seem to me to have a totally different character since Christmas. Short term Fibs are being brushed aside where normally I would expect retraces. We know that several central banks have a heavy finger on the buy buttons with Japan particularly active. These are known colloquially as the Plunge Protection Teams. While the US markets are in firm rally mode, the FTSE and Dax are lagging badly, especially the former. I suspect the Bank of England is not buying UK shares, at least in big volume. And that is probably why it lags. The recent surge in GBP is also a factor. Hmm. I note that the MSM ascribe the surge in GBP to increased optimism about a ‘no-deal’ Brexit outcome being highly unlikely. They also ascribe the poor FTSE performance to the horrors that await after a not ‘no-deal’ Brexit. Seems they have their knickers in a twist – again. Rec all we have been long GBP/USD for some time and short FTSE. The China/US trade talks are back on! And stocks were up on the day big-time in defiance. But is this marking peak optimism – and the major top in stocks I have been looking for? Markets usually top when everything looks real hunky-dory, never when the news is ‘bad’. Remember, the news follows the market – and this one is no exception. Conventional wisdom has it that when stocks are favoured, gold loses its shine. Stocks up = gold down. Then how do you explain the $60 advance in gold since January when the Dow has surged by 3,400 points? That makes no sense, does it? 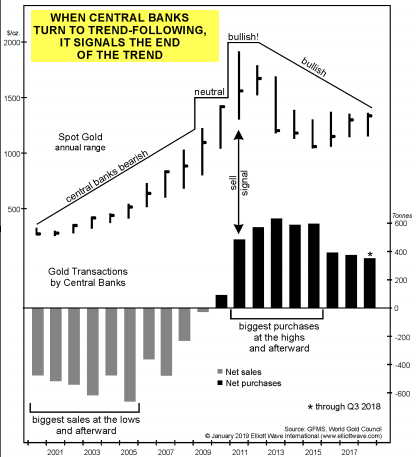 Another market myth is that when the dollar advances, gold retreats. So why did gold move with the dollar up together in recent days? Sorry, but that is another wrong belief that traps unwary traders. No, the fact is that markets are not linked as cogs in a wheel. A move in one market always produces a move in another is conventional ‘wisdom’. Just a glance at historic charts will disprove that hypothesis. They have dynamics that are relatively independent and create their own wave patterns along the Elliott Wave model. Here is the long term weekly chart showing the ATH in 2011 at $1,920 when the consensus had it that it would surge way past $2,000 – and to the moon! And what do I spot? Why, a possible five=year Head & Shoulders reversal pattern! It has all the correct ingredients including a strong momentum divergence at the Head low. 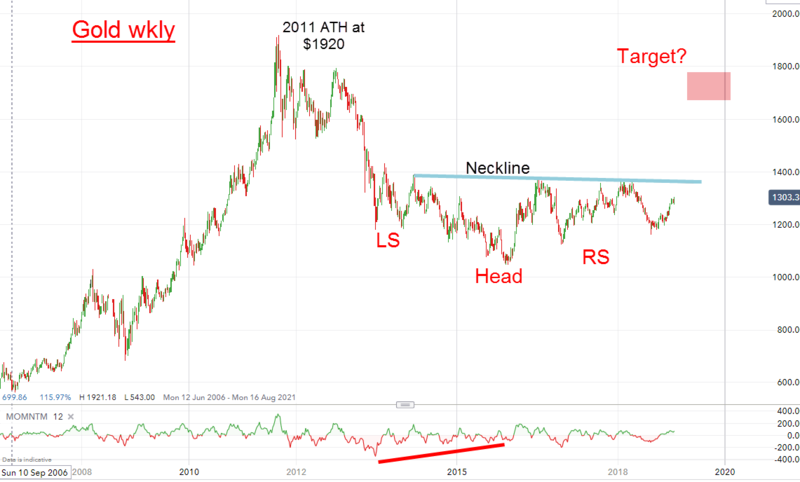 The neckline lies at the $1350 area and the market closed just above $1300 yesterday. If this is correct, I have an upper measured target around the $1650 – $1700 area. But of course, there is many a slip between cup and lip so I will be monitoring the waves carefully. 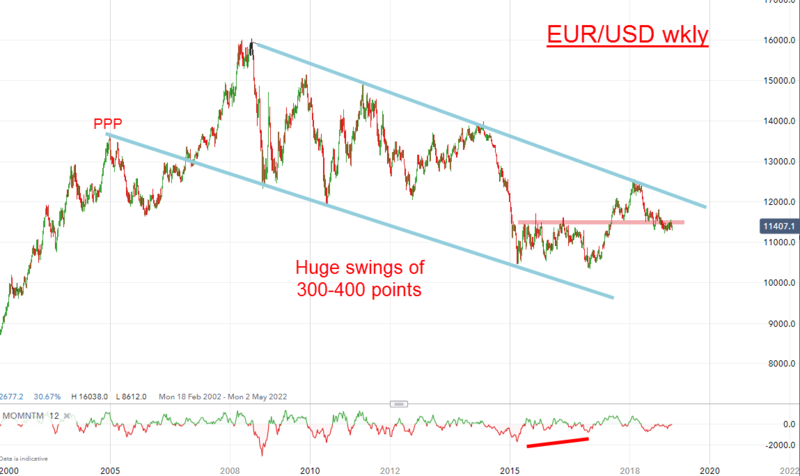 One possible tailwind is that when stocks turn down in a third wave, I am quite sure gold will be well supported. VIP traders Club members remain long. There is plenty of negativity around the euro. At Davos, ECB top man Draghi poured cold water on any revival in the EU economy and the euro. But markets have a funny way of moving off-script, as they have here. I almost wrote that I have lovely tramlines, but the lines are not quite parallel, thus offering the possibility it is in reality a wedge. Last week, it tested the lower support in the 1.13 area (pink zone) and surged yesterday to 1.14. So if this is the start of a rally phase, the upper line beckons at the 1.20 area. Note the up/down swings have been huge since the 1.60 high in 2008. That condition should prevail. And if there is a clear upward break of the upper line, my next target is the 1.25 area. And please take my survey. Thanks.